Vintage 1937 Photo - Ken Evans Alfa Romeo P3 - Grand Prix Germany 1937 - Nurburgring. This is a vintage & original photo from the Ken Evans archive of Ken's P3 being pushed to the starting grid for the 1937 German Grand Prix at the Nurburgring. To the right we see the Alfa Romeo 8C-35 of Vittorio Belmondo (entered by Count Salvi de Pero) en far in the background the also privately entered Alfa Romeo 8C-3 of Raymond Sommer. Scuderia Ferrari entered 3 Alfa Romeo 12C-36's for Tazio Nuvolari, Nino Farina & Count Trossi but to no avail as the best they could manage was a 4th spot for Nuvolari. 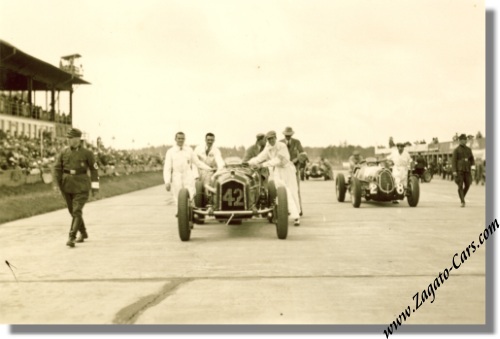 Ken Evans brought his Alfa Romeo P3 home in 9th spot while Belmondo came home in 12th (& last!) place. The photo measures a mere 7.75 x 5.25 cm or 3 x 2 inches and is in excellent condition for its age bar a thin spot on the back which does not affect the image.